The guy with the most games played at the catcher position in franchise history is Wes Westrum. I'll never know what his parents were thinking naming him Wes. That's like naming a kid Tom Thomas. 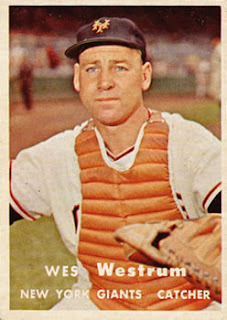 Anyway, Westrum was the backstop for some great staffs of the last 11 years in New York. He was a 2 time all star and won a World Series in 1954. I'm not going to lie, it's not easy finding great stats for Westrum. He was a typical defensive catcher that batted 8th in the lineup. The best thing I could find was that he walked 104 times in 474 plate appearances in 1951. There really are no other stats. The 902 games is what puts him on this list. He's the franchise leader in games played at a position, it means he did enough right. I didn't know much about Harry Danning before I did this. I still really don't. He was a 4 time All-Star for the National League. He played in 2 World Series but the Giants lost them both. His career batting average was .285. It's not spectacular, but he was a catcher. The last 3 seasons of his career Harry had more walks than strikeouts. I guess he had a patient eye. For some reason Harry Danning retied after the 1942 season. He was only 31 years old at the time. Its possible that he would have been at the top of this list had he played just a few more years. As it is, many of us barely know who he is, and with the emergence of Buster Posey this whole list will look different in 5 years. 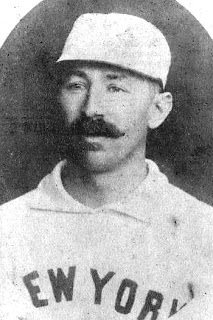 The first catcher ever inducted into the Baseball Hall of Fame was Buck Ewing. 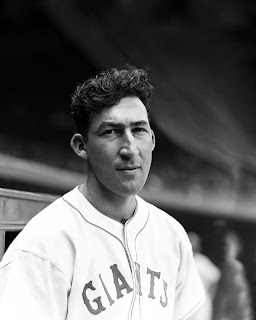 He was a member of the New York Gothams that later became the Giants. He was inducted to the Hall in 1939, its 4th year of existence. Buck was the first man in history to hit 10 home runs in one season. Doing so in his first season behind the plate, 1883. The very next year he went out and led the league in triples, showing a rare combination. The New York Giants first two championships were in 1888 and 1889. Buck Ewing was the starting catcher for both. He is widely regarded as the first great modern catcher. His batting average with the Giants was .306 and he stole 178 bases over 9 seasons. There hasn't been the greatest tradition of catchers in the long history of the Giants. Buck Ewing was the first, and still is, the greatest catcher ever to play for the franchise.